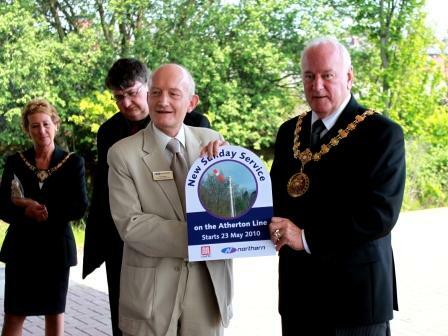 An historic day celebrated in style at Walkden ! The first Sunday train in 41 years ! 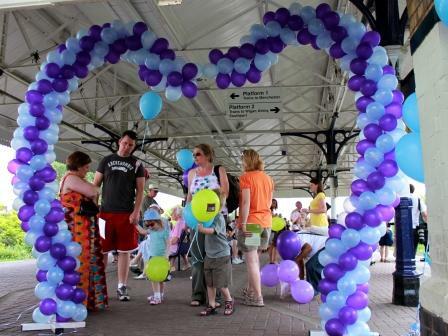 Hundreds of people turned out to enjoy the sunshine and station gala to celebrate the re-introduction of Sunday trains at Walkden station today. 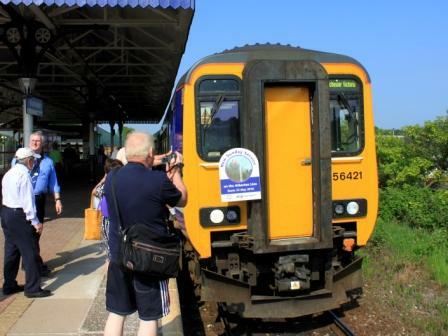 As the first train drew in at 0937 people were already gathering – including one adventurer off on a day trip to London – now that’s what we call making the most of the new service ! 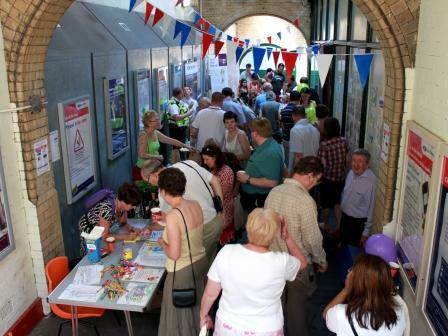 At 11am the gala opened with the station festooned in bunting and balloons. Stalls from FOWS, local businesses, Northern Rail and British Transport Police kept the crowds entertained as the arrival of the guest of honour – the new Mayor of Salford Cllr George Wilson – was awaited. A series of short addresses from Mark Barker of Northern Rail, the Mayor himself , Councillor Keith Whitmore (chair of GMITA) and Peter Aust of FOWS preceded cutting of ceremonial ribbon, cake, and a presentation from Northern Rail of replicas of the headboards decorating the morning trains. 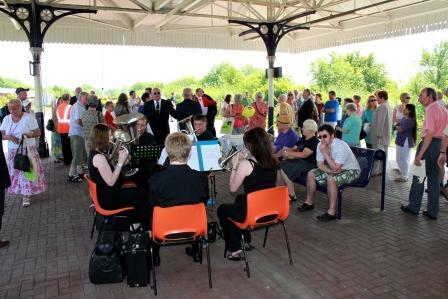 The Beau Brass band pumped out some great brass tunes while Cafe Chino served up coffees and refreshments – meanwhile the arrival and departure of each train was greeted with applause and cheering. The trains themselves were pleasingly busy – verging on crowded in a couple of cases – a great sign that word of the new service is out ! 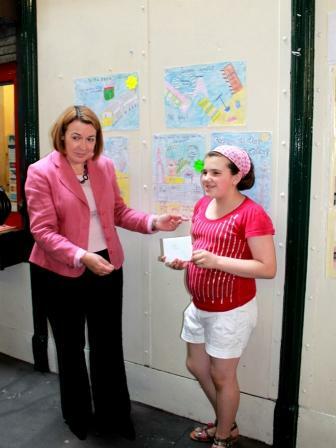 The booking hall was decorated with brilliant posters designed by the children of Christ The King and St Paul’s schools, and Barbara Keeley MP – who has been instrumental in our campaign for Sunday services – presented prizes to the winners selected by the Mayor. Amidst the festivities some serious points about the short-comings of the present station were also underscored – wheelchair-bound people are unable to enter the station because of the 3 flights of stairs which also make life difficult for elderly or infirm passengers. And on the platform itself the visiting dignitaries witnessed first-hand how difficult boarding the trains can be due to the large platform gap. We would like to thank everyone who came to the station today and gave us such a warm feeling about the community’s regard for the station. and many many more … ! Thank you all – and everyone else who helped today. And to the miserable soul who stole the the flowers we planted for the occasion … we hope they look nice in your garden and you’ll consider inviting the community in one day to enjoy the plants they paid for.